RB411 is is end of life (EOL). Mikrotik recommends RB411GL for direct replacement. Introducing the RouterBOARD 400 series, the perfect low cost CPE. The RB/411 is a very small and cost-effective client device. 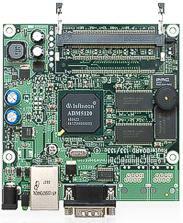 With one LAN and one miniPCI you can use it on wireless sites as the best price/performance CPE board available on the market. Bundled with MikroTik RouterOS this will be your perfect solution.